I’m always tempted to write “Liquid Sunshine” on my homemade lemon extract labels, because that’s exactly what it reminds me of. 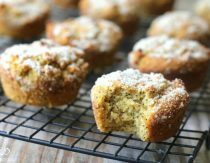 The bright flavor is perfect for making poppyseed muffins or lemon bread with vanilla glaze, and it’s ridiculously easy to make. Just combine two ingredients with a little time and voila! 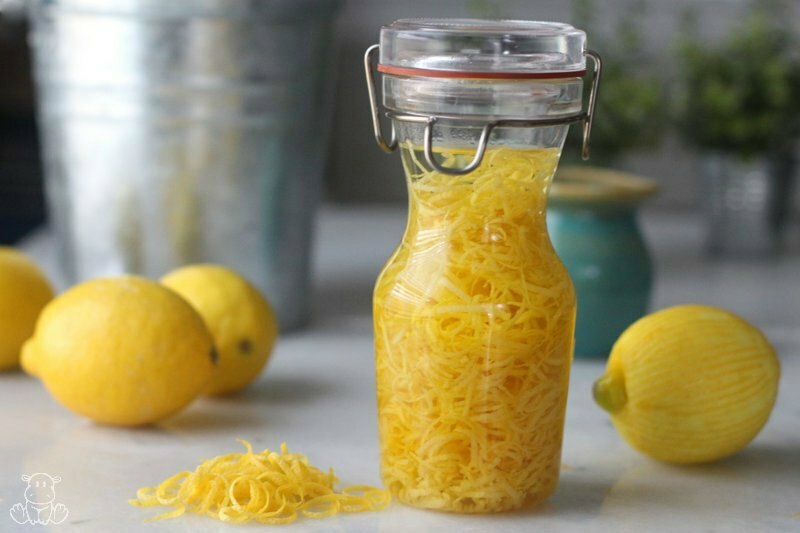 Sunshine in a bottle that’s perfect for baking and making homemade limoncello. 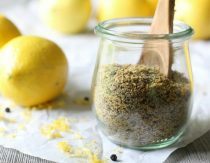 If you’re only using a lemon or two at a time, place the zest in a bag/container in the freezer and continue adding to it until you have enough to fill a small (or large) jar. Organic lemon peels – Free because I was already using the lemons. Vodka, which is often used to make lemon extract, is sometimes made from genetically modified corn and/or enzymes derived from genetically modified organisms. Manufacturers say that none of the genetic material makes it through the distilling process to the final product, but to my knowledge that has not been independently verified. Organic options are hard to find, but there are certain sources that are still likely to be GMO-free. Absolut says they’re non-GMO. Absolut is made from wheat, but the company says that the final product does not contain gluten. Potato-based vodkas are naturally gluten-free and non-GMO. Want to make an alcohol-free extract? Though alcohol-based extracts are most common, substituting food-grade glycerin is an option for people who don’t consume any alcohol. Glycerin-based extracts take longer to infuse than alcohol-based ones, but they also have a unique sweetness that some people like. Using a vegetable peeler or zester, cut thin slivers of the yellow skin in long ribbons. Make sure not to peel off the bitter white pith, just the outside will do. Choose a jar that will be about 3/4 filled by the peels when they are placed inside, then add the peels to the jar and pour in vodka or glycerin. Add a lid and shake well. Place the jar in a dark cabinet for 4-6 weeks. Shake every few days for the first week, then occasionally after that. When the extract has reached the intensity you prefer, strain peels and pour extract into a clean jar. Remember that glycerin takes longer to ripen than alcohol, so it may need longer than six weeks depending on the ambient temperature of your home and how strong you want it to be. When ready, store your extract in a dark cabinet or the fridge. What’s your favorite way to use leftover lemon peels? What a fun gift idea! Where do you find the little glass bottles with the cork toppers? UUm,, excuse me maam but is it applicable to use vinegar rather than using vodka? You would create flavored vinegars with this option. Might be interesting for salad dressings, or savory meals. I, personally, would not use vinegar in place of an extract, you will definitely taste the vinegar. Not what most want in their baked goods, or desserts. 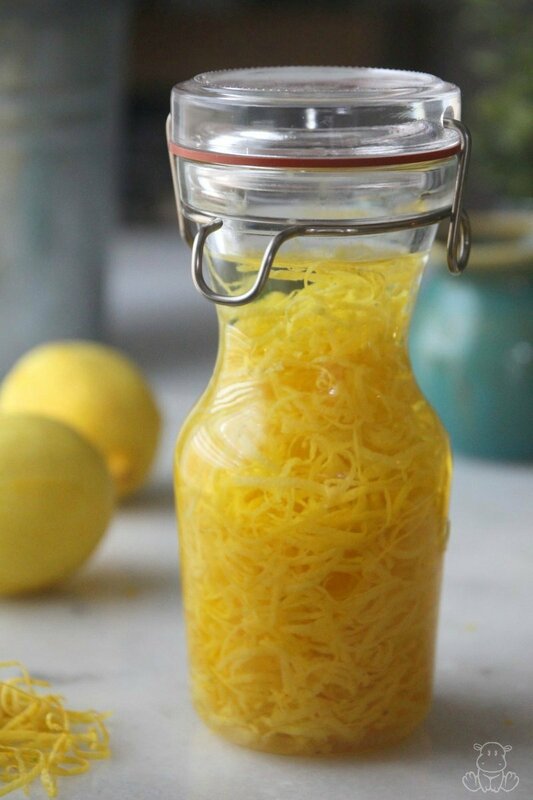 This is how you make limoncello, too, except without the simple syrup. I’m living in a country that doesn’t grow lemons, so I’m pretty sure the ones we have in supermarkets have been sprayed with who-knows-what-chemicals. Normally I peel the lemons I use and that makes me feel a bit more secure, as I imagine that those chemicals don’t penetrate such thick skin. How much do you think I need to clean or what should I use to clean the lemon skins to make sure I don’t ingest those chemicals later on? Soak your lemons in Apple cider vinegar for a few minutes. That should take care of the pesticides. I scrub my lemons and other fruit with baking soda. I have cooking wine. 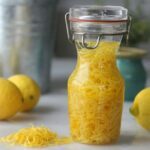 Will that work with lemon zest to make extract? DO NOT use cooking wine. It contains salt. YUK. No.. Not at all.. You need to use grain alcohol. Like Vodka Everclear Or something homemade thats a high proof alcohol.. I have made vanilla and lemon extracts and made enough for Christmas gifts. This year I want to make almond extract……………………anyone????? I need to start soon!!!! I was just wondering……what if you honestly can’t stand vodka? Could you use rum instead, like you can for the mint and vanilla extracts? You sure can. I’m not exactly sure what it would taste like, but it sounds delicious. I made vanilla ectract with rum. I like it better than with vodka. Try it with dark rum to, just for fun. is there an alternative to using alcohol, or is that the only way to make extract? I like the flavor of Ketel One vodka, so I researched it a little ( I did not ask the company). It’s made with wheat, but apparently gluten is mostly removed during the distilling process (http://www.gluten-free-for-life.com/ketel-one.html), although some people apparently do react to it (http://www.gfreefoodie.com/the-great-gluten-free-vodka-debate-the-answers-please/). Anyway, the latest information I could find is that there isn’t GMO wheat out commercially in the world, so wheat based liquors should be GMO-free 🙂 I’ll probably try Ciroc too, because it’s made with grapes, so I think we would be safe on both fronts, because I don’t think GMO graphs are available, yet, either. Maybe not GMO grapes, but grapes are one of the most heavily pest-infested crops, therefore take a lot of pesticides and almost cannot be grown organically in this day in age. Personally, I’ve seen evidence that some organic alternative pesticides can be just as dangerous or more dangerous than conventional “chemicals” mainly because they are more bioaccumulative. I honestly don’t know how to trust anything but local, homegrown by someone you know, but it’s a luxury. All things in moderation?? Just FYI for all you wheat and gluten free people…..we buy luksusowa vodka. It’s made from potatoes. We use it for all our homemade extracts. 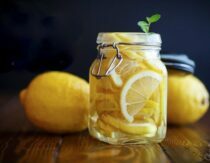 can lemon extract go bad ? I cannot make it as I need it NOW? The alcohol has to have time to EXTRACT all the oils from the lemons. In turn becoming your lemon extract.. you have to wait … I have heard a warm dark shelf is fastest.. I thank you for your extract recipes! Plan on trying the lemon and mint. Could you tell me the shelf life of these extracts. They would make good Christmas gifts, but how far in advance could you make? Thanks! If you use a high proof alcohol like ever clear, it should have an indefinite shelf life. Also, the higher the proof, the faster it extract the oils! Does anyone know how much extract you get? After waiting 6 weeks or so do you get 1 cup of extract or does it reduce during that period? Thank you. Can you consume the extract, say as drops in your water? Thanks but I want to know if the lemon extract can be used in making liquid soaps or detergents. Can’t it be made without the vodka by just using water? I saw a recipe for homemade vanilla just using water. Haven’t tried it yet but I do have the vanilla beans. Now all I need to do is find the recipe again. HA! HA! You could use glycerin instead of vodka, but not water for two reasons. First, it’s not very good at extracting the flavor. Second, it would have a very, very short shelf life. I make a lot of tinctures and I’ve been trying to find non-GMO vodka. I was excited to see your links, unfortunately they do not work. 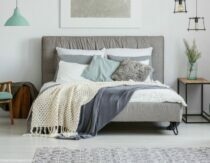 Could you post the names of the sites? can I use 96% ethanol alcohol instead vodka? Well the lemons weren’t free if you paid for them, so that’s mildly deceptive. Even if you were using them anyway. Did you pay for them? Anyway, thanks for the recipe. hi, is there anything I can use instead of alcohol (my religion forbids consumption of ANY alcohol), also these extracts can they be used in DIY saops, lipbalms , lotions etc… ? Glycerin can be used instead of alcohol – it will take longer to infuse, though. Please I need lemon extract to use for flavour in body. Cream can I use coconut oil or olive oil for the extraction instead of vodka or rum? We use water based flavors from Bickford Flavors for years now, but no Meyer lemon flavors. I’d like to make my own Meyer lemon flavoring. How can I do this with water based, rather than alcohol/vodka based? Thank you for the recipe!! Excited to try it. If you are looking for an organic vodka brand I use Prairie Organic Vodka for my vanilla extract, and it always delicious! What can I possibly use the lemon extract for? I add it to poppyseed muffins, lemon bread, and homemade limoncello. Recipes for the muffins and bread are on the blog, and the limoncello will be up soon!